From The New Criterion. May 31, 2008. As I walked down the street near my home in suburban Virginia recently, I saw a decrepit Volvo sporting a bumper-sticker palimpsest. The barely legible original layer must have been as ancient as the vehicle itself, and by now there was no bumper space left, fore or aft, uncovered by this automotive wallpaper. What could be read of it consisted of the names of mostly forgotten Democratic candidates, national, state and local, from the last 20 years or so and fragments of slogans that had once cost several Volvos’ worth of focus groups to come up with. That’s really the problem with bumper stickers, isn’t it? However great your enthusiasm for a candidate or his pithy surrogate wisdom, people probably don’t want to be reminded of it twenty years later. For most of us, the urge to identify ourselves with a particular candidate seldom survives more than a year or two in office unless we are the kind of party hack for whom an unbroken record of puffery itself confers a social cachet. One of the stickers on this car sported no candidate’s name but read, simply, "I don’t vote for felons." A dim memory stirred in me, but I couldn’t quite call to mind who the felon was that the car’s owner — a very fat man in a cowboy hat — was unnecessarily and, now, retrospectively disavowing any intention to vote for. It took me a block or two, but I eventually remembered that it was the supporters of Senator Chuck Robb in his last successful campaign, in 1994, who had produced these bumper stickers as attacks on his Republican opponent that year, Lt. Col. Oliver North. Senator Robb had not been popular — hence the absence of his name — but his handlers thought, as it turned out correctly, that he still might be more popular than a "polarizing" figure like Col. North. One slight difficulty was that the Colonel was not a convicted felon. Or rather, his convictions had been overturned, so he was not, properly speaking, a felon at all. No big deal. The rhetorical right to continue insisting on his felony was assumed by his Democratic opposition and accepted by the public as either being true enough or else the kind of distortion that was only to be expected from politicians these days. After all, the declaration didn’t mention Col. North by name. Perhaps it was simply posed as a hypothetical. If there were any felons running for office this year, I wouldn’t be voting for them. Should you supply the identity of the unidentified felon yourself, and it happens to be that of somebody who is running this year, that’s your lookout. 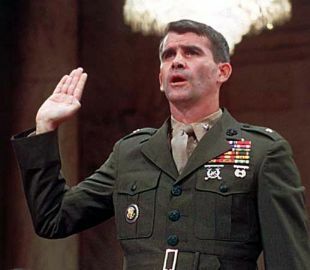 But the principle by which Oliver North’s alleged felonies were thought by many to be fair game is one that has been more and more often applied in American politics since 1994. The Brezhnev doctrine of mud-slinging says that once anything has been plausibly alleged to the discredit of one’s opponent it must always be regarded as being to his discredit. In other words, strong partisans regarded it and still regard it as a fair tactic to treat allegations as proven facts even if they are shown to have no foundation. Democrats, at least, are allowed by the media culture the benefit of any doubts of this kind in making allegations of unfitness for office against Republicans. Senator George Allen, the Republican who defeated Senator Robb six years later was himself beaten six years after that because he used an obscure word, "macaca," which sounded to the Washington Post vaguely like a racial epithet and so could be mentioned over and over again in the press coverage of his campaign as "raising doubts" — to go along with some similarly manufactured doubts that the Post was able to raise — about the enlightened character of the senator’s attitudes towards other races and, therefore, his fitness to exercise the public trust (see "Biased Sensationalism" in The New Criterion of December, 2006). Even if "macaca" could have been shown to have had no racial overtones, it would probably have made no difference. Last year, Rush Limbaugh was treated both by Democrats in Congress and by the media as if he had called those Iraq war veterans who took a different view of the conflict from his own "phony soldiers." He could and did protest that he had done no such thing. He could even play the tape of his remarks on which it was clear to the meanest intelligence that the phony soldier he had been referring was in fact a phony soldier — someone who had pretended to have been in Iraq when he hadn’t even made it out of basic training. He had said nothing at all about critics of the war who had actually taken part in it, but that made no difference. Scandal had become its own justification. We have seen something similar more recently, during the primary campaign, when several Democrats, including Senator Barack Obama, distorted a remark of Senator John McCain’s about his willingness to garrison peace-keeping American troops in Iraq, like those in many other parts of the world, for decades to come. To Senator Obama, this meant that he was advocating "100 years of war." This was too much even for the Washington Post, whose "Fact Checker," Michael Dobbs, was put on the case. "Take a look at what McCain actually said in Derry, N.H., back in January," Mr Dobbs wrote. Cutting off a questioner who talked about the Bush administration's willingness to keep troops in Iraq for 50 years, McCain said "Make it a hundred." He then mentioned that U.S. troops had been in Germany for 60 years and in Korea for 50 years, and added, "That’s fine with me as long as Americans are not being injured or harmed or wounded or killed." Mr Dobbs, acting as referee in this dispute, thus awarded Senator Obama Two Pinocchios and placed two representations of the head of Disney’s version of Collodi’s long-nosed wooden boy at the bottom of his column. This meant that Senator Obama had been guilty of "significant omissions or exaggerations." The fact checker had spoken. His sanction was not so severe as would have been Three Pinocchios, signifying "significant factual errors," or Four Pinocchios, which meant "Real whoppers," but it was about as near as the media have so far come to giving Senator Obama a slap on the wrist. I’d have thought that saying Senator McCain "wants to continue a war in Iraq perhaps as long as 100 years" is both a flat factual error and a real whopper, but the media’s self-appointed referee had decided to be more lenient. The objective Washington Post had judged that this lie should not count as a lie but only as a "significant exaggeration." But even if the ref had condescended to call it a real whopper, his occasional column with its jolly Pinocchio rankings would remain in essence just a way of condoning lies by politicians. Like the promiscuousness with which Democrats have charged President Bush with lying, it makes lying ordinary and assumes that it will be accepted. To say that "Bush lied" is itself a lie, but it also excuses itself as such by implicitly asserting that lying in politics is merely a matter of what the most determined partisans can make stick. This is also one of the paradoxical consequences of the media’s obsession with scandal. The more scandals they uncover, the less any of them matter. Scandal has become our political way of life. Occasionally, as when it involves the sort of spectacular hypocrisy that the Elliott Spitzer scandal did, it leads to resignations, but we’re getting used to the idea that politicians must simply live with scandal and that, especially if they are Republicans, they must expect to be called liars or worse but without the shame and disgrace that formerly attended such a charge. In the same way the New York Times recently editorialized about the Bush administration in the matter of electronic eavesdropping against terrorism as follows. "The president will continue to claim the country is in grave danger over this issue, but it is not. The real danger is for Mr. Bush. A good law — like the House bill — would allow Americans to finally see the breathtaking extent of his lawless behavior." You would think that an allegation of lawlessness on the part of the country’s chief law-enforcement officer would be the stuff of banner headlines, not tucked away in the last sentence of an editorial which doesn’t even propose any remedy for the enormity it alleges, save for the passing of more laws. If The New York Times really believed what it said, wouldn’t it also and necessarily advocate impeaching the President? For that matter, if "Bush lied; people died," why wasn’t he impeached years ago? The answer is, of course, that both allegations of mendacity are not meant to be taken literally but rather as political tactics. In the rhetorical context of the media’s scandal-culture, all accusations of lying should be assumed to be lies themselves, even in the increasingly rare cases when they are true. Mrs Clinton’s confabulations about having landed under sniper fire in Bosnia, for example, though demonstrably untrue, were not more so than her manufactured résumé of executive experience which the media and even her political opponents have tacitly agreed to accept as true on the grounds (I guess) that it would be ungallant to do otherwise. It wasn’t her fault, after all, but that of the sexism of America’s political culture that she was only First Lady and therefore limited, at least after the debacle of health care reform, to largely ceremonial duties. Something like this is also true of Senator Obama. When Geraldine Ferraro said that "If Obama was a white man, he would not be in this position," it was a hypothetical proposition and therefore unprovable one way or the other. But given the enthusiasm with which his candidacy has been welcomed by those who have cited the Senator’s "post-racial" identity — and therefore, since a white man cannot be post-racial, his race — as reasons for their excitement, it is at the very least a plausible view. But Mrs Ferraro quickly discovered that the truth or falsity of her statement was irrelevant in any case. She had trespassed on the conventional truth that Senator Obama had risen to the near vicinity of the presidency by his own unaided efforts and qualities of character. To suggest otherwise was to court the charge of racism, just as it was to flirt with sexism to do the same with Mrs Clinton. Like the Gaullist myth that Paris had been libéré par lui-m me, these were and remain conventional truths that the political culture as a whole and not just the partisans of one side or the other has a powerful interest in maintaining. We see that what is to be treated as a lie and what as the truth are always at least partly political constructs. But this process of political myth-making is thrown into confusion when it collides with the media’s conceit of themselves as truth-tellers. The truth is that they are, like the rest of us, selective truth-tellers — which, looked at another way, makes them as much liars as the politicians they spank, as they find it convenient to do, with their ridiculous Pinocchio-heads. The New York Times, for instance, clearly does not believe its own words when it accuses the President of lawlessness, nor does it expect its readers to believe them. "Lawless" is a bit of rhetorical posturing and so it is widely understood to be by all concerned. Like "100 years of war" or Rush Limbaugh’s phony soldiers or Colonel North’s felony conviction or the lack of any connection between the war in Iraq and the threat of al-Qaeda, it is a lie which the Times hopes to elevate to the status of one of those conventional truths the denial of which can be represented in the media as a "gaffe." It’s all part of the cut-and-thrust of rhetorical politics in the post-modern era. Stymied of anything sufficiently scandalous to feed the media’s perpetual sense of grievance and outrage, the gaffe-patrol may be driven to making things up — including charges of making things up. But sometimes, Democratic candidates are allowed to fire off their own gaffe-seeking missiles, particularly when some shrewd political operative for one side or the other in a hard-fought primary campaign finds something in the words or deeds of the opposition that a significant group of electors might find offensive. Not surprisingly, in view of the fact that one such group consisted of white church-goers and gun-owners, the media themselves were a bit slow to pick up on the potential offensiveness of Senator Obama’s saying to a closed-door fund-raising event in San Francisco: "It’s not surprising that they get bitter, they cling to guns or religion or antipathy to people who aren’t like them or anti-immigrant sentiment or anti-trade sentiment." Team Hillary, focused at the time on maximizing her vote among Pennsylvanians with white skins and blue-collars, was quicker to spot an opportunity. "Senator Obama’s remarks are élitist and out of touch," said Mrs Clinton. "Americans who believe in the Second Amendment believe it’s a matter of a constitutional right; Americans who believe in God believe it’s a matter of personal faith." She did not find it necessary to add that she herself, to judge by her recorded pronouncements on the subject, was not among those who regarded the Second Amendment, at least as it is interpreted by a great many Pennsylvanians, as a matter of constitutional right. No more did Senator Obama feel it incumbent upon himself to add that he, too, had taken his place among the presumptively embittered by professing religious belief and by enthusiastically echoing the anti-trade sentiment of many a non-San Franciscan Democrat. As in the case of his "spiritual mentor," the Reverend Jeremiah Wright, Senator Obama was slow to dissociate himself from the supposedly offensive remarks. Polling results in Pennsylvania were inconclusive as to whether or not anyone had actually been offended, but actual offense was no more required to be proven than actual truth for the gaffe to strike home. Still, it must have seemed galling to reflect that he had been guilty of no more than the condescension that the media and his fellow Democrats show all the time in psycho-analyzing the more conservative segment of the electorate. Many in the circles that both Democratic senators frequent regard it as almost a truism that conservative opinions in general, and those to do with guns or religion in particular, are the product of some psycho-social pathology. How unfair that she should now be pretending to take them seriously! But the rules of the game require the media to believe in this pretense, just as they must believe in his own laughably feeble disavowals of the views of the Rev. Wright. The truth, as usual, has no constituency of its own.